Most of you would never eat your dog or cat for Christmas or any other meal, and we condemn, sign petitions and protest those who participate in the dog or cat meat trade. 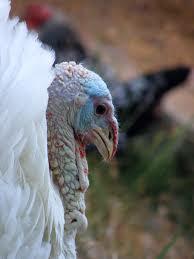 And yet tens of millions of beautiful, intelligent turkeys are killed and served at holiday tables every year. Turkeys are smart animals with loads of personalty just like your pets. They love to have their feathers stroked and even do a dance when they see a person they recognize. And just like your cute little puppy or kitten, turkey’s develop a strong bond with individuals who spend time with them. I am not going to go into the horrific details of how these birds are treated for the short five months of their lives, but I will say that it is NO different than the cruel and disgusting treatment of dogs in the meat trade or the elephants and rhinos in the ivory trade. 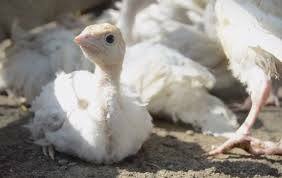 I will tell you all baby turkeys are subject to excruciating mutilations without any anesthetic of having all “non-essential“ body parts cut off - beaks, toes, snoods (the fleshy red protuberance that dangles over turkeys’ beaks and is used to attract mates). Sadly, their painful and traumatizing death comes as a relief to the torture they endure while crammed into sheds that allow them only a couple of square feet of space. In fact, just in the US alone, millions die while being transported to the slaughter houses - they are kicked and thrown, their legs and wings are broken off, all so families can eat their single holiday meal. Understand this, there is NO such thing as a humane slaughter. These animals do not want to die and the processors who kill turkeys have no interest in being kind in anyway. Their mandate is to make money spending as little time as possible with the kill and processing. There is nothing humane about inflicting violence and death on animals just because people like the taste of their flesh. Humans have zero biological need to eat meat, dairy or eggs! So what can you do? The simple answer is to STOP eating and serving turkey or any other meat. Whether you’re looking for store-bought, order-online, or make-your-own options, it’s easy and delicious to veganize your favorite holiday main dishes. There are literally millions of vegan recipes on the internet. I have tons of recipes in the Food section of this blog and they are all very easy and delicious. At some point in the not too distant future, you will not have the choice, as the water, earth and air will be of such poor quality, raising animals for food will be impossible. Our compassion towards animals does not need to be taught, we simply need to stop un-teaching it!